A Good Makeup Primer For Under $10? 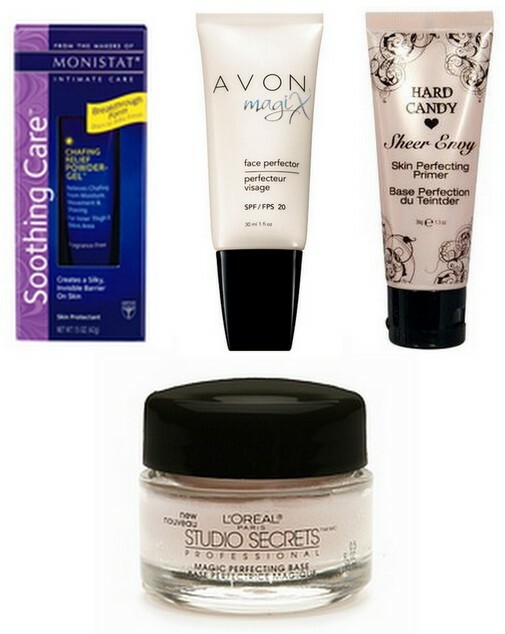 From top left: Monistat Soothing Care Chafing Relief Powder-Gel , $6-9; Avon MagiX Face Perfector SPF 20, $10; Hard Candy Sheer Envy Skin Perfecting Primer, $8 (also with SPF); L’Oreal Studio Secrets Magic Perfecting Base, $12.95. One beauty frontier I haven’t crossed is the use of primer. By all accounts, primer is magic, smoothing over wrinkles, filling pores, and making foundation last all day. It’s the difference between cakey and airbrushed, the plebeians and the celebrities. I need some of that. Even so, most of the name primers are expensive (the one I hear most about, Smashbox Photo Finish, is $32 for 1 oz). I found I couldn’t bring myself to spend $$$ for a tiny tube of goo that would probably make me break out, if it did anything at all. For years, then, primer stayed on that long list of things I think about occasionally but never do. Lately, though, I’ve come across budget primers (see above), and not only are they cheap, but they’re supposed to be good. I bought the Hard Candy primer during a recent Walmart visit, and will report back; the one I’m most interested in, though, is the Monistat Chafing Relief Powder-Gel. Users swear the product (which has nothing to do with yeast infections) is a drugstore double for Smashbox Photo Finish. And it’s under $10. Heck yeah. Have you tried any of these primers, or their more expensive cousins? Is primer worth the hype? I’ve always had a soft spot for 1920s fashion, ever since The Dagger of Amon Ra. Now the Poiret revival, which started on SS07 runways and dominated FW07 shows, has made 1920s style cool again. Flapper dresses, feathers & fringe, lace mitts, turbans, head wraps & cloches, long beaded necklaces, and high-necked capes–they’re all back, and it’s wonderful. Another thing that’s back: 1920s hair. Reem Acra’s current ad campaign featured not only bobs, but finger waves. 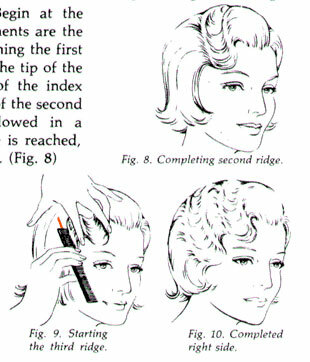 If you want to try them out, grab a friend and check out Vivid Infinity’s finger wave instructions, taken from a 1960s cosmetology book. These are the instructions BUST traced over for their finger wave article (Feb/Mar 05, pgs 35-36), so you know they’re good. UPDATE: The models in Reem Acra’s ads probably have marcel waves, which are similar to finger waves, but done with a curling iron. A three-barrel waver would do the job.